The new Cygnus spacecraft is the cheeriest of the cargo tugs hauling gear to the International Space Station. Those new round solar panels are effective, efficient, and adorable! 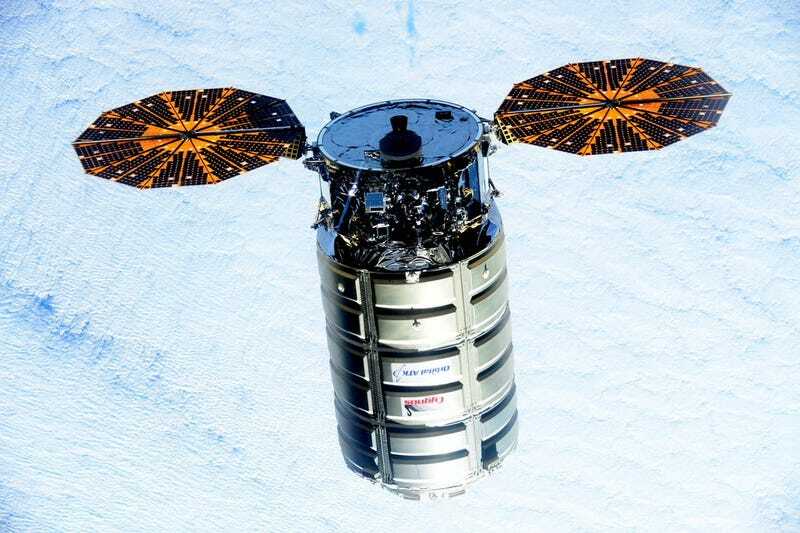 When the S.S. Deke Slayton II launched in December, it was the first mission of the newly-upgraded Cygnus spacecraft. The upgrades included an expanded cargo hold and reworked service module, but the most visually striking difference is the new solar panels. Instead of stiff rectangular bars like on every other spacecraft (including older-model Cygnus spacecraft), the Cygnus now sports a pair of cheery round orange-yellow Ultraflex solar arrays. Now the spacecraft putters around in orbit like a mouse with over-sized ears, and adds a spark of whimsy to the harsh angularity of the International Space Station. Paired with the capsule’s round bound, Cygnus adds some much-needed curved contrast to the endless right angles of the space station. The change in form is driven by function. The round fan-fold allows for higher performance at a lower mass than typical arrays. The arrays also fold up smaller than traditional arrays, reducing the stowage volume during launch. Earlier versions of the technology were used on the Mars Phoenix Lander, while the current version will be used on the InSight Lander to Mars when it eventually launches. Really, there is no question. Roscosmos’s Progress is bulbously utilitarian. JAXA’s HTV series are stripped down to the bare minimums (although they do explode quite gloriously during reentry). SpaceX’s Dragon is aiming for sleekly modern. But Orbital’s Cygnus spacecraft is the most whimsical of the lot, bringing a dash of cheer along with every delivery. The Cygnus spacecraft was unloaded of its cargo. For the past month, it has been reloaded with expired experiments, dirty laundry, and other unwanted materials. It will be jettisoned from the space station and sent on a destructive path to burn up in the atmosphere as part of a fiery garbage day soon.